Carlee is an Olympic weight-lifter, a mother of two, the owner of a gym, and an amazing CrossFit Athlete. 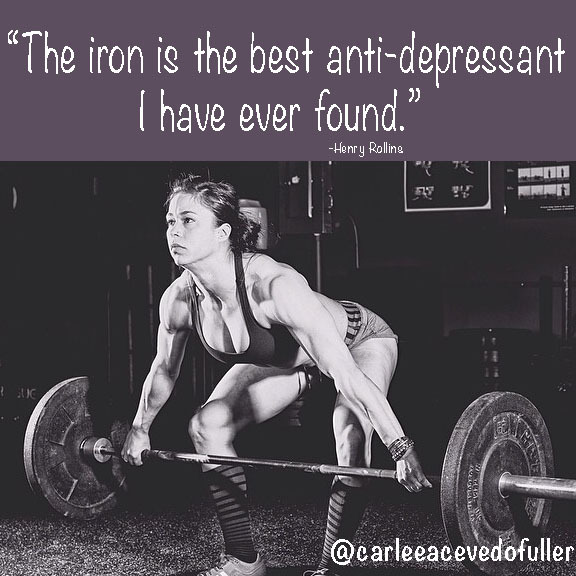 Last night, she posted on instagram showing a photo of the max doses of Prozac, anxiety pills, and serequil that doctors prescribed her for 7 years to cope, and another photo with a quote from Henry Rollins of how lifting is her new medicine. “Here I am, many years later going strong. Am I perfect? No. If I feel depressed I get up and go train. If I have anxiety, I do the same. I save these plethora of pills to remind me how far I have come.